Lightweight, low profile all synthetic waterproof breathable one and a half boot for higher elevations, winter mountaineering and ice climbing in cold conditions. The Batura 2.0 GTX uses cutting edge proprietary two layer Gore® technology to create a boot that is warmer and more breathable for technical routes in the mountains. An integrated external gaiter with an asymmetrical zipper uses stretch Gore® technology to keep you dry while the inner boot uses another Gore® layer to allow moisture transport to the outer layer creating the ideal climate for your feet in cold conditions. The low profile upper construction and reduced midsole profile allow the boot to climb better with or without crampons. A stiff honeycomb carbon insole supports the foot and creates an air chamber for better insulation and rigid performance when front pointing or edging on rock. 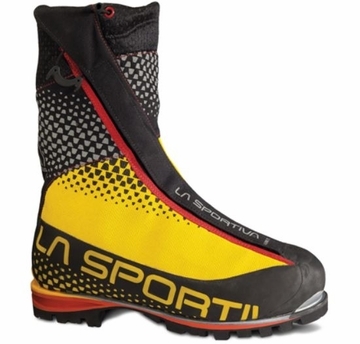 This boot takes the whole game to another level for alpinists.